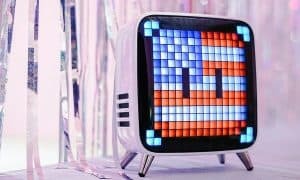 The Tivoli Go Andiamo is a unique looking speaker that sounds decent enough but is lacking a few key Bluetooth speaker functions. 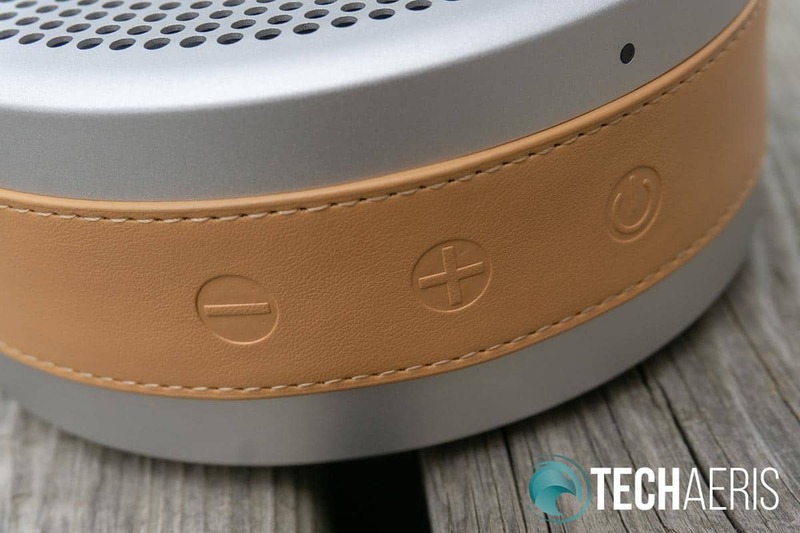 Every once in a while, a Bluetooth speaker comes along with a design that differs from the norm. 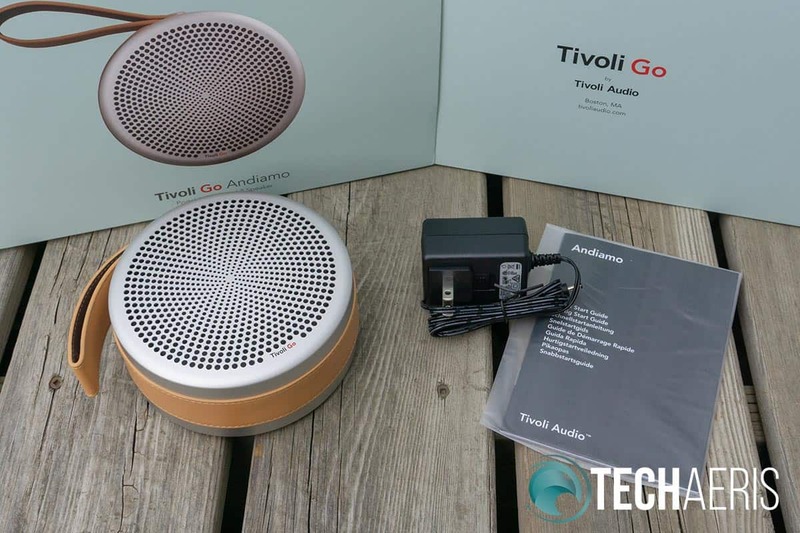 Our Tivoli Go Andiamo review takes a look at one such speaker which has a unique design coupled with high-quality build materials. 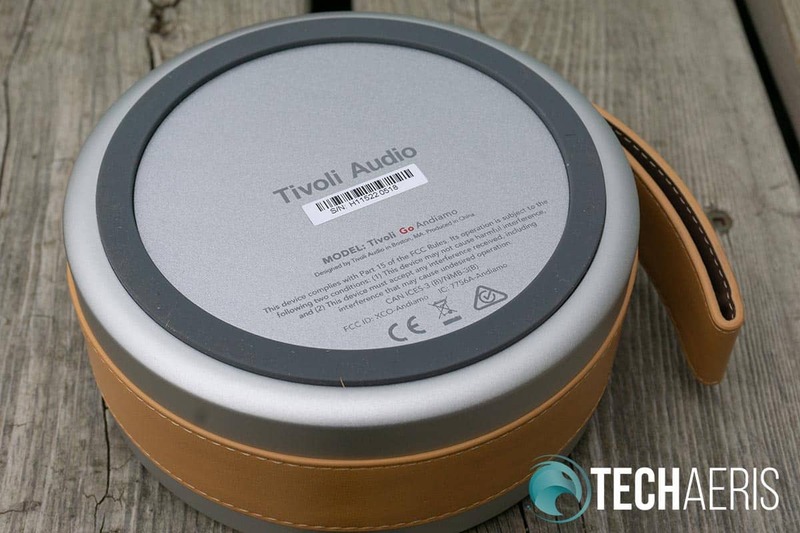 Read on to see what we thought of one of the lastest speakers from the Tivoli Go collection from Tivoli Audio. 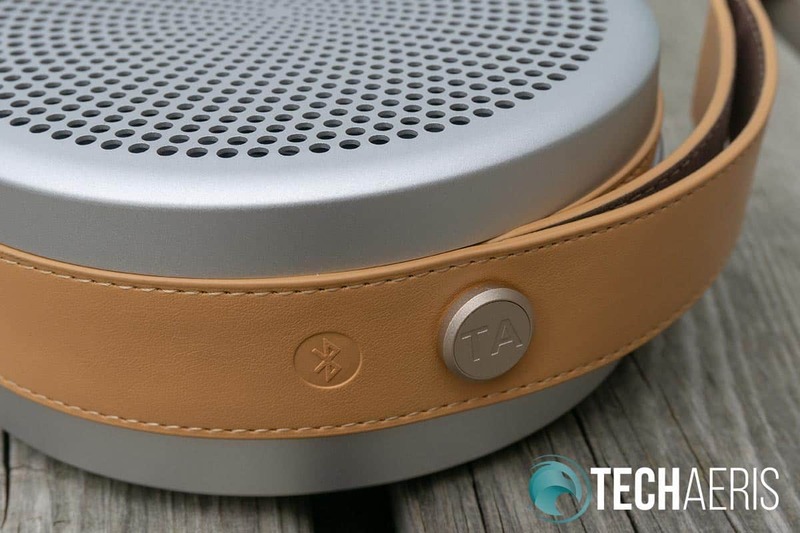 One of the things the Tivoli Go Andiamo portable Bluetooth speaker has going for it is its looks and premium design materials. Circular in shape, the Andiamo is 5.3-inches in diameter and just over 2-inches in height. 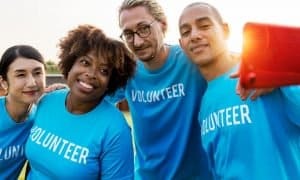 The main casing is made of aluminum and features a 1-inch light brown leather strap that wraps around the middle and ends in a loop for holding, carrying, or hanging from a hook. The Tivoli Go Andiamo definitely has a premium look and uses quality materials. 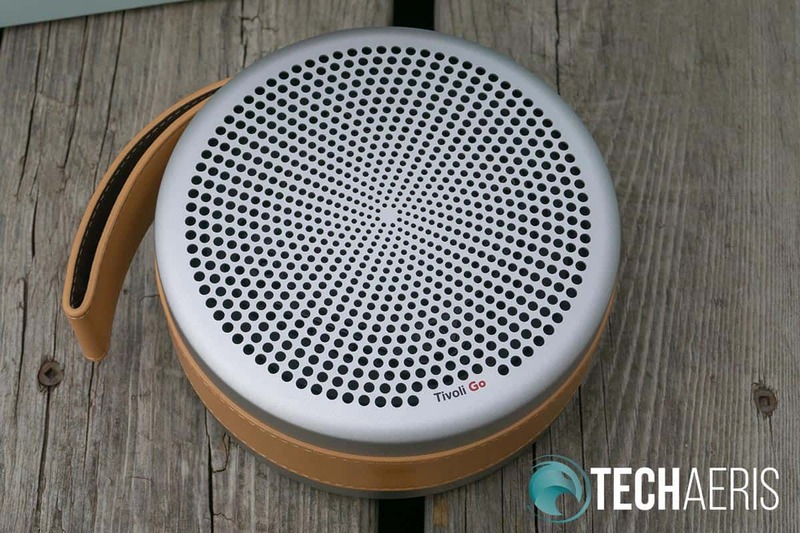 The top of the speaker features your typical speaker holes, in this case arranged in a classy looking circular pattern with the Tivoli Go logo printed near the bottom. 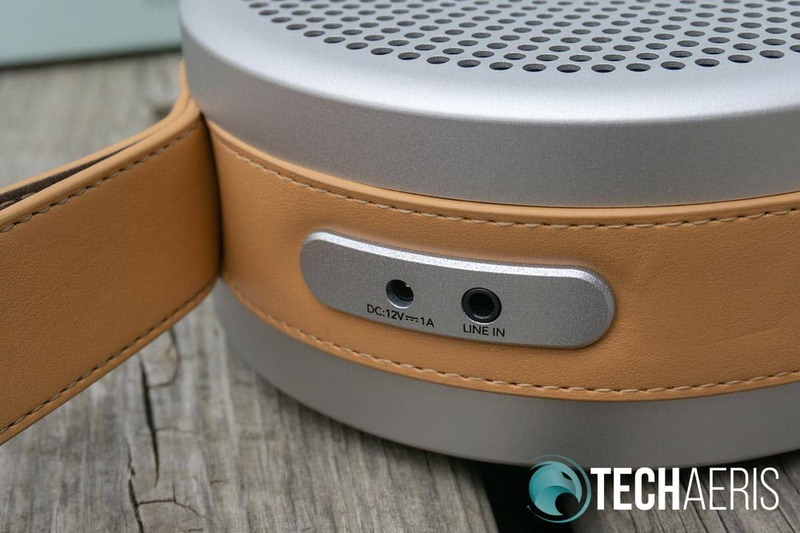 As far as controls go, the volume up, volume down, and power buttons are stamped into the leather with a small LED indicator light positioned in the aluminum enclosure just above the power button. Further back is a Bluetooth pairing button just in front of the aluminum plug adorned with the TA icon at the base of the strap. The volume down, up, and power buttons. Hidden under the strap is the proprietary power jack — another miss given the proliferation of Micro-USB or USB Type-C charging solutions these days — and the 3.5mm line input inset into an aluminum piece. Finally, the underside of the speaker has a roughly 3/8″ wide rubber ring that goes around the base for added grip and to prevent both scratching on the speaker and whatever you may be setting it down on. The rubber ring does a nice job of preventing scratches on the speaker and your table. 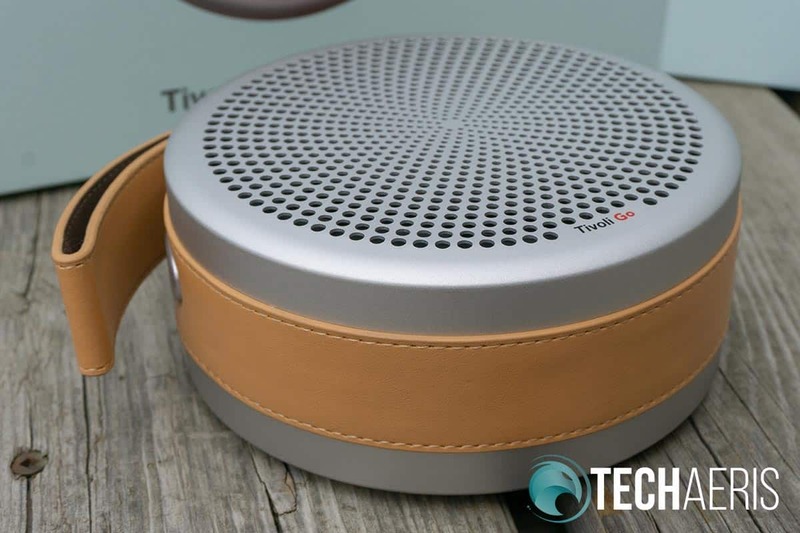 Overall, the Tivoli Go Andiamo Bluetooth speaker is a nice looking speaker constructed from premium materials, albeit a bit on the heavy side. While our review unit came in silver with a light brown strap, a black on black version is also available. 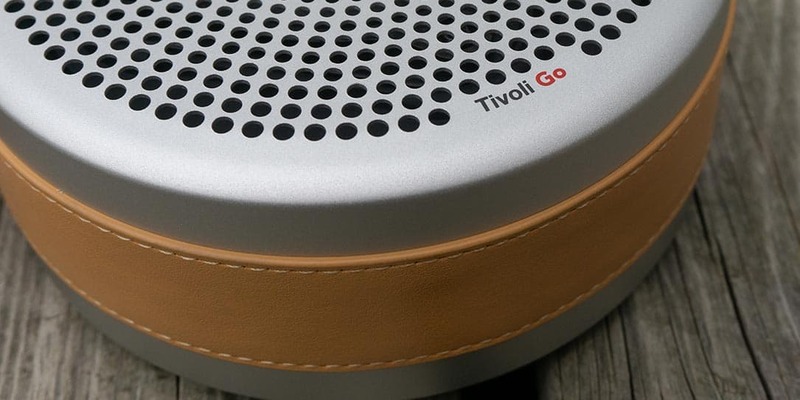 Like most Bluetooth speakers these days, the Tivoli Go Andiamo is easy enough to pair with your device. Simply turn it on and press and hold the Bluetooth button until the LED starts flashing blue. Once it is, you should see Tivoli Go Andiamo in your list of devices. Select it and you should be paired up. As with most Bluetooth speakers these days, pairing is super simple. While the Andiamo has volume controls, what it is lacking is any kind of playback controls. That means you can’t skip ahead or back to the previous track, or even (more importantly) the simple ability to play/pause the current track. 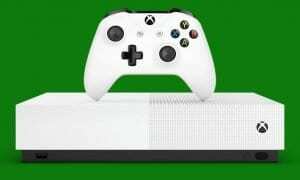 In my opinion, this is a serious omission from any Bluetooth speaker released these days. 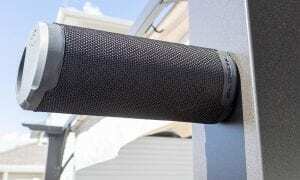 While I personally don’t use it with a Bluetooth speaker, the Andiamo is also lacking the speakerphone function that is present in almost any other Bluetooth speaker on the market today. As far as sound goes, the Tivoli Go Andiamo can get pretty loud. Even better, it boasts independent volume controls, meaning it doesn’t control volume on your phone giving you two ways to adjust and fine tune volume. 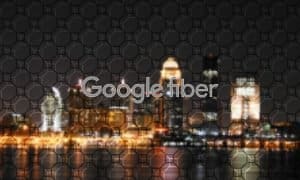 With the speaker set to full volume and the volume on my Pixel 2 XL set to about 25%, I found the Andiamo was loud enough to fill the room. When in the back yard, setting my phone volume to about 50% was enough to be heard comfortably pretty much anywhere in the yard. Crank it up, though, and the speaker starts to distort around 75-80%, and the distortion is definitely noticeable. 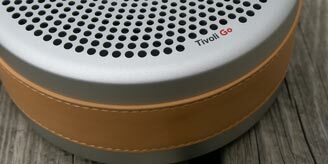 Top view of the Tivoli Go Andiamo: full on speaker grille. For the most part, the sound is pretty balanced, although on occasion it does sound just a tad underwhelming. The bass end is more punchy as opposed to warm and full. 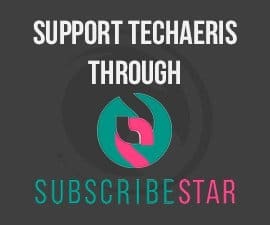 This is most noticeable in hip-hop, EDM, and other bass-heavy genres. While it doesn’t sound bad, I do prefer the warmer full bass as opposed to the punchier bass. That being said, the bass is there and you can feel it when the speaker is set on a table. Tivoli claims the battery in the Tivoli Go Andiamo lasts up to 20 hours between charges. As we all know, that depends on volume and type of music listened to. 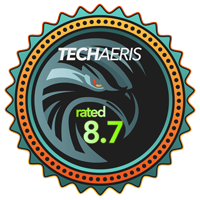 During our testing, we did see between 18-20 hours when used at about 50% volume with various types of music being played. Once depleted, the speaker takes about 2-3 hours to fully recharge using the included charger. The proprietary power adapter port and 3.5mm line in jack. With an MSRP of $199USD, the Tivoli Go Andiamo isn’t exactly cheap. Sure, it’s well constructed and has a slick design, but it is missing some key features like playback controls. 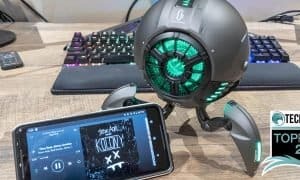 The Tivoli Go Andiamo is a unique looking speaker that sounds decent enough but is lacking a few key Bluetooth speaker functions. Hopefully, the next iteration of the Tivoli Go Andiamo will add those key functions to provide better value. *We were sent a review unit of the Tivoli Go Andiamo for the purposes of this review.